We invite you to explore our Center. 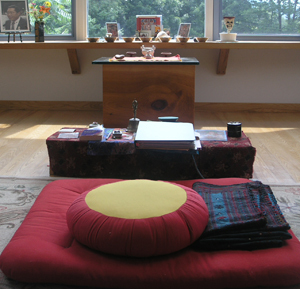 We offer programs designed to help people of all traditions discover their inherent sanity, gentleness and goodness as well as public meditation and Shambhala Buddhist teachings. We also offer space for individual and group retreats, combining the shrine room with the upstairs retreat apartment and the adjacent large apartment building and its generous common space for group activities. For more information about our retreat apartment, please click here.